Indies exclusive pale pink vinyl. generations and so it makes sense to have this lush and layered album that bounces seamlessly from one sonic aesthetic to another. This was the case on 2016’s ‘HEAVN’, which found Woods hopeful and exploratory, looking along the edges resilience and exhaustion for some measures of joy. Her new album, ‘Legacy! Legacy!’, is the logical conclusion to that looking. From the airy boom-bap of ‘Giovanni’ to the psychedelic flourishes of ‘Sonia’, the instrument which ties the musical threads together is the ability of Woods to find her pockets in the waves of instrumentation, stretching syllables and vowels over the harmony of noise until each puzzle piece has a home. The whimsical and malleable nature of sonic delights also grants a path for collaborators to flourish: the sparkling flows of Nitty Scott on ‘Sonia’ and Saba on ‘Basquiat’, or the bloom of Nico Segal’s horns on ‘Baldwin’. 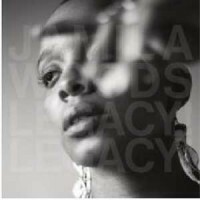 More than just giving the song titles the names of historical black and brown icons of literature, art, and music, Jamila Woods builds a sonic and lyrical monument to the various modes of how these icons tried to push beyond the margins a country had assigned to them. On ‘Sun Ra’ Woods sings “I just gotta get away from this earth, man / this marble was doomed from the start” and that type of dreaming and vision honours not only the legacy of Sun Ra but the idea that there is a better future and, in it, there will still be black people.